Trawling Twitter at dire o’clock in the afternoon desperately, quixotically, searching for meaning and /or distraction I found a tweet which told me that some author or other was giving his book away on the Kindle-ma-bob. Usually, these tweets are from nasty Americans who taunt the UK book-buying and /or downloading public with novels that are not permitted to be sold to UK book-buyers and / or downloaders (and probably aren’t worth the reading in any case). This one seemed to be, genuinely, from a ‘real’ person (@BlueDoorBooks I think it was), with the backing of the publishing house, having been shared by them. What? I follow Harper Collins?! Why on earth… Oh yeah, to get free books. So I downloaded it, via – shudder – Amazon Whispernet and there it was on my bottom-of-the-range Kindle, for which enhanced audio content is NOT AVAILABLE*. It begins well in the fractured, multi-narrative that has become a little bit popular in the wake of Lost, only in much shorter instalments. On matters of plot, there is what might be likened to an M. Night Shamalamadingdong “happening” and a whole bunch of people are very slowly telling the reader all about it. Some people experienced The Broadcast or The Testimony (a bit of word play as one might consider the narrative streams as the characters’ testimonies) and some didn’t. Some took it stoically and some didn’t. Some turned to religion and some didn’t. And lots and lots of people die. For many reasons. Which would spoil the surprise. As it’s told in retrospect it quickly became clear that all of our testifiers survived to testify (although to whom? How are we reading this? ), and it’s quite easy to spot who does die and who doesn’t so it’s not much of a shock when they do. And the passages crawl by excruciatingly slowly in places, so much so that it’s difficult not to jump ahead – if you do you are very likely to miss crucial details or hints so try not to – with some characters seemingly redundant and having no purpose (like the single appearance of the Iranian school teacher, the Chinese gamer, and the Indian doctor who appears heavily early on but feels superfluous except to add cultural ballast). 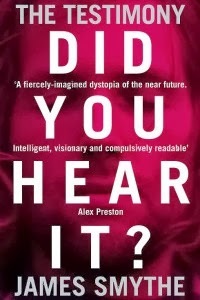 It’s an overly long, predictable story, but one that has been very well realised, and it kept my eyes drifting back to the Kindle when I should have been meditating or would otherwise be playing online poker. That the author reads or has read lots of Stephen King (gargh! **) is clear, given the death toll, but at least there are no aliens, and no convenient and plausible explanation is given for The Broadcast. The casual throw-away line about project Orpheus – no spoilers here – as the cause of so many unexplained deaths is vaguely annoying but I suppose if that particular mystery hadn’t been resolved it would have been a zero-for-god-knows-how-many mystery resolution count. As it is, the supposedly unsatisfactory leaving of loose ends is strangely satisfying, and concludes what is otherwise an entertaining and enjoyable feat of multiple ventriloquisms. As publisher-driven e-book freebies go, it certainly did its job, in so far as I ended up buying one of the author’s other novels, The Explorer (available from all good etc. and also on his website) for the handsome sum of three Great British Pounds and ninety-nine Great British Pence. This has now gone somewhere near to the top of my virtual to-read pile, behind Michael Chabon’s Telegraph Road and Freaks by Caroline Smailes et al. And Don Quixote. And Plato’s The Republic, The Unbearable Lightness of Being A Prawn Cracker by Will Self, and at least two of (@craigstone_) Craig Stone’s rather random novel-type things. So not very near the top. But as a Welsh author of note (I’m assuming he’s from Wales given the accolade Wales Book of the Year – Fiction which he won for this self same book, and his inclusion in the Parthian anthology of new Welsh writing, Nu) I feel honour bound to do him the courtesy of highlighting my good intentions to read his stuff at some point. In that respect he’s in esteemed company. *Therein lies a tale which is so boring as to render it less interesting than this footnote.